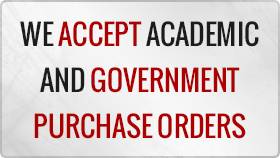 Orders from Government departments including provincial, state and publicly funded institutions including, public schools, colleges, universities, hospitals, utilities, public libraries, municipalities and all branches of the Canadian and American government and military, then you have the option of paying by Purchase Order. If your business or organization uses purchase orders, you can send us a purchase order by e-mail. All purchase orders are subject to approval. Once a valid purchase order is received and verified, our customer service will process the order. Payment terms are net 30, we do not accept POs with terms longer than Net 30 days. Payments for purchase orders are cheque or EFT (Electronic Funds Transfer). 1. Choose the items you wish to purchase and add them to your Shopping Cart. 2. Sign In or Register (create an account). 3. At Checkout, enter Billing and Shipping information. 4. Select a Shipping Method where the shipping charges will be calculated. 5. Select Purchase Order as your Payment method. 7. Press Continue to process your order. 8. You will be instructed to forward us a copy of your signed Purchase Order by email or Fax : 1-888-428-4793, this all we require to process your order. *Your order will remain on-hold until it has been authenticated and processed by our Customer Service Team. Please note: If your order is not placed during normal business hours (8:00 a.m. to 5:00 p.m., EST), it will be processed during the next business day. Please contact our customer support team by email at sales@alfaplanhold.com if you have questions about your purchase order.